Water is an essential part of our bodies. In fact, up to 60% of our bodies consist of water. This miracle liquid is responsible for maintaining fluid levels in the body that assists with absorption, transporting nutrients through the body, maintaining the body’s temperature, digesting food and many other vital functions. Mayo Clinic reports that a recent study found the need of water consumption for men and women to be different. They found men need around 3 liters of fluid per day, while women only require around 2.2 liters of fluid per day. They also recommend counting total fluid intake towards your water consumption. On the other hand, reports that nearly 50% of the American population does not consume an adequate amount of water in one day. Water therapy is a hydrotherapy technique that provides several health benefits. The technique has been used as a traditional treatment during the 18th and 19th century. It is also known as the Japanese, Indian or Chinese Water Therapy. This technique involves the consumption of up to one-and-a-half liter of water upon waking up, on an empty stomach. It is advised that the body will have more bowel movements during the first phase of this technique, but will soon adapt to the change and health benefits will also soon start to show. Water is essential to keep the body hydrated. Harvard School of Public Health reports that more than half of the children in the United States are not properly hydrated. A study that was conducted on 4,000 children aged between 6 and 19 years provided evidence to support this statement. They also report that boys are 76% more likely to be inadequately hydrated than girls and non-Hispanic black children 34% more likely to be inadequately hydrated than non-Hispanic white children. Morning water therapy will rehydrate the body and restore floods to the body that was used up during the night. This results in a refreshed feeling and a boost in energy. Mercola reports that the brain consists of 75% water. Daily Mail reports that a single glass of water can speed up the brain’s processing power by up to 14%. Water Benefits Health reports that water provides the brain with essential electrical energy to assist the brain with memory processes, thought processing and numerous other brain health. The benefits of water therapy on the brain include a more focused mind, better creativity and the ability to improve memory. When water is consumed on an empty stomach, it can easily move throughout the digestive system. A vital function of water therapy, especially in the morning, is to purify the colon. By purifying the colon, the body is able to absorb nutrients from future meals easier, which leads to increased energy and a better overall “healthy” feeling. Many weight loss enthusiasts are using water therapy as an aid to their weight loss regimen. 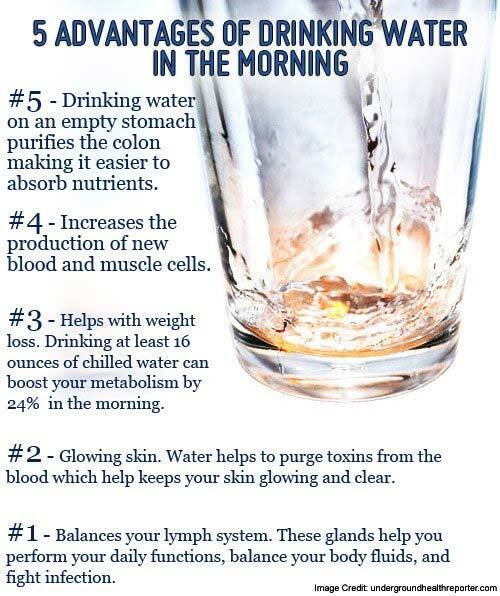 Research shows that 16 ounces of cold water in the morning can help boost a person’s metabolism by up to 24%. The water should be consumed on an empty stomach to experience this benefit. Dehydration can cause the skin to look older and drier. It takes away the natural glow of the skin and makes the skin look older than the person really is. 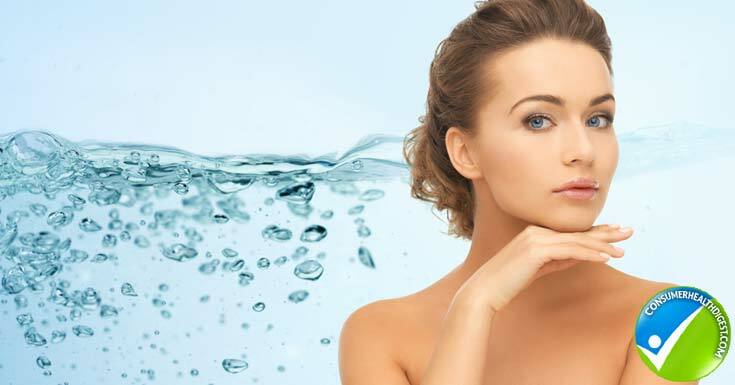 By using morning water therapy, toxins in the body is flushed out, which helps to restore the hydration of the skin. This results in the natural glow of the skin returning. Skin will also start to look and feel younger. Many people struggle to eat breakfast in the morning. John L Ivy from the University of Texas at Austin reports breakfast to be the most important meal of the day. New York Daily News reports that approximately 31 million American citizens say they skip breakfast every day. Drinking water in the morning on an empty stomach can actually increase your appetite and help you finish that bowl of cereal. A major cause of headaches is dehydration. In fact, Mercola reports headaches as one of the top three symptoms of dehydration. Drinking water upon waking up will immediately provide the body with much needed hydration, thus also fighting off the potential of a headache rising up due to dehydration. The Faculty of Health Sciences at McMaster University study shows that up to 27% of the American population might be affected by chronic constipation. Drinking water on an empty stomach in the morning can help stimulate bowel movement and avoid constipation after consuming breakfast or meals during the rest of the day. While sleeping, the body goes through a natural process of repairing and cleaning itself. This causes an excess amount of waste to be present in the body. Drinking water in the morning will flush the waste that was created during the night out of the body through urine. Water is an essential part of our body and also helps the immunity system with several functions by balancing the lymphatic system. This, in turn, boosts the effectiveness of the immunity system and also fights off infections and many other types of illnesses. Water is life. It is a part of our bodies and we simply cannot live without it. Many people fail to realize just how important water and proper hydration is for their overall health. 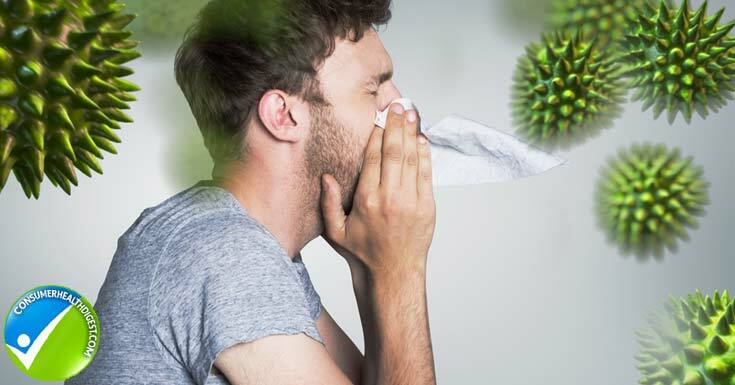 Failing to realize this can lead to an array of unpleasant conditions and symptoms. Water therapy have been researched and used for centuries and is a great way to provide your body with essential hydration while also gaining many additional health benefits.